Japan is hot spring paradise. Some volcanos are active and make unique quality of hot water. Hot spring make us relax, vitalize body, healthy, and make our skin smooth and beautiful. Some hot springs release radium and final hope for cancer patient. This site has lots of wild pictures. I like hot spring near beach. This is one of my favarite one, “Sunship Imai-hama”. 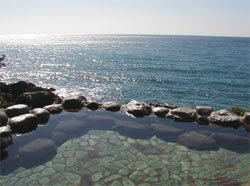 The photograph of the Sunship Imaihama Onsen looks very inviting. It reminds me of two hot springs I have enjoyed on Sakurajima, Kagoshima. I also write about Japanese hot springs at hotspringaddict.blogspot.jp. Unfortunately, Sunship Imaihama closed on Sep 30th,2012. There are lots of wild hot spring in Japan so please enjoy.